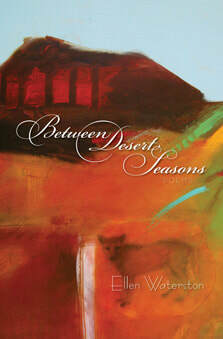 "The music of Ellen Waterston's language in Between Desert Seasons is touching and vibrant, fiery raw and refined, reined in and set free. The endings of so many of these poems are startling and perfect, compelling re-readings just to experience again the turn of logic and imagination that created them. I'm grateful for the open voice of this book that has allowed me to enter places, meet people, and experience ebvents I might otherwise have missed." "The poems in this collection search for a way beyond loneliness of self first by naming that loneliness and then by threading connections to the multi-layered world beyond the self...In Between Desert Seasons Waterston has found a way to "plant words strong enough" to do the work of describing what it means to be human." "The men and women in these poems travel diverse landscapes from Oregon to Baja in search of love, solace, and the meaning of a touch. Ellen Waterston creates vivid, singular moments that shine beyond the words on the page." 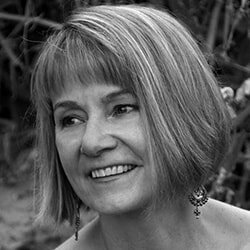 "The truth is: Ellen Waterston's poems arrive. They situate themselves naturally, to proceed in compelling, telling ways. Each poem leaves something behind." "Ellen Waterston's new poems come from years of living in a desert of high revelation...[Her] poems create an oasis for all of us--a clear, remote, and vital spring, a woman's life beyond any macho western settler's museum or mirage." As a New Englander who married and moved to the ranching West, Waterston grounds her writing in both of those cultural and geographic landscapes. Her award-winning essays, short stories and poems have been widely published in numerous journals and anthologies. Her memoir, Then There Was No Mountain, Rowman and Littlefield publisher, was selected by the Oregonian as one of the top ten books in 2003, and nationally was a Foreword and WILLA finalist earning her an appearance on Good Morning America with Diane Sawyer. Her collection of poetry, I Am Madagascar, was awarded the WILLA Prize in Poetry in 2005. She is the winner of the 2007 Obsidian Prize in Poetry, the 2008 Oregon Quarterly Essay Award and the author of two children's books, Barney's Joy and Tea at Miss Jean's, Roberts Rinehart publisher. Waterston is the recipient of numerous writing residency fellowships and honors, including the 2005 Fishtrap Writer-In-Residence, a 2003 Special Literary Fellowship for Women Writers given by Oregon's Literary Arts, and a 2007 honorary PhD in Humane Letters from Oregon State University/Cascade Campus for her work as an author and in support of the literary arts. She is the founder of the Writing Ranch www.writingranch.com , which supports writers through seminars and retreats, and is director of The Nature of Words, an annual literary event held in Bend, Oregon the first weekend of November.Where the Crooked River Rises, a collection of personal and nature essays on the High Desert is slated for publication in 2009. She is working on a novel. Waterston received her Bachelor's degree from Harvard University and Master's degree from the University of Madagascar.